After reviewing the Interim and Final Cleanup Reports, human health risk assessment, and ecological risk assessments, the Division of Water Quality is proposing to closeout the Notice of Violation/Stipulated Compliance Order issued to Chevron Pipeline Company. This action will be executed in accordance with the draft Stipulated Compliance Order that identifies Chevron Pipeline Company’s remaining obligations regarding the spill. Public comments on the draft Stipulated Compliance Order and Screening Ecological Risk Assessment are welcome until Thursday, December 3, 2015. Additional information is available at the public notices website. 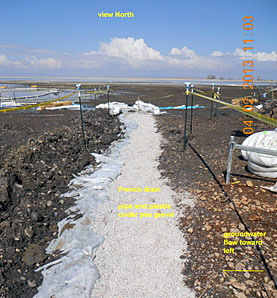 On April 6, 2015 Chevron submitted the Willard Bay Incident Final Clean-Up Report (40.3 MB). This report documents all of the activities to clean up the spilled diesel fuel and residues and was required by the Notice of Violation and Compliance Order (954 KB) NOV/CO issued to Chevron on April 12, 2013. DWQ will review this report for completeness and update the Screening-Level Ecological Risk Assessment . A 30-day public review and comment period will be held for the revised ecological risk assessment. After both the revised ecological risk assessment and clean-up reports are determined to be complete, DWQ anticipates drafting a closeout for the NOV/CO. The closeout will consider all available information and determine if any additional actions are needed to meet the requirements of the NOV/CO. The draft NOV/CO closeout document will be public noticed for comments for 30 days. The Human Health and Ecological Risk Assessments for the Willard Bay Diesel Spill found no unacceptable health risks to humans or the ecology. DWQ will carry these results forward in its final decision documents, which are anticipated to be completed in June 2014. Based on the conclusions of the human health risk assessment, DWQ has determined that the fenced-off area at Willard Bay is clear to be opened up for use by the general public and that the fence can be taken down. The public comment period for the Human Health and Ecological Risk Assessments for the Willard Bay Diesel Spill closed on May 9, 2014. DWQ did not receive any comments. The most recent groundwater sampling at Willard Bay showed that there is the possibility that pockets of residual contamination may remain in the shallow groundwater based on the data from two monitoring wells (MW-4 and MW-6). Further analyses will be undertaken to confirm these findings. Additional clean up actions that may be necessary will be undertaken by Chevron as directed by DEQ Division of Water Quality. The sampling results for MW-4 and MW-6 do not modify the conclusions of the Human Health or Ecological Risk Assessments. The analytical results from the August 2014 sampling event were compiled and used to estimate the potential health risks to people and the environment of any remaining diesel residues remaining after the site was cleaned up. The risk assessment results are used to by DWQ to evaluate the adequacy of the clean-up efforts after the March 2013 diesel spill. DWQ will accept public comments on these two risk assessments until 6:00 on Friday, May 9, 2014. After the close of the public comment period, responses to the comments will be prepared and the risk assessments revised as necessary and finalized. DWQ will then prepare a Decision and Notice of Violation Closeout document that will include any additional actions required of the Chevron Pipeline Company with regards to the March 2013 diesel spill. Additional requests for information or comments can be submitted to Chris Bittner, Utah Division of Water Quality, via email at cbittner@utah.gov or by mail at P.O. Box 144870, Salt Lake City, UT 84114-4870. Mr. Bittner can be reached by phone at (801) 536-4371. The Willard Bay Settlement Agreement includes $4.45 million to fund mitigation projects to improve and protect waterways and environmental areas affected by the diesel fuel spill. The Division of Water Quality DWQ) is soliciting proposals for these mitigation projects beginning February 4, 2014, and ending May 5, 2014. Projects may include infrastructure improvement, environmental projects, or studies or educational activities that protect or improve water quality. DWQ will evaluate the proposals based on specified criteria. During phase two, DWQ will notify the successful applicants that they have been selected and ask them to submit detailed project plans. An application form and project requirements can found at Willard Bay Settlement Request for Proposals (23 KB). The Water Quality Board approved the Settlement Agreement at its January 22, 2014, board meeting. Division Director Walt Baker signed the agreement on January 28, 2014. DWQ received 29 comments on the proposed Settlement Agreement and provided responses (43 KB) to these comments in the event summary. The Division of Water Quality and the Division of Utah State Parks and Recreation have negotiated a $5.35 million draft settlement agreement with Chevron Pipe Line Company in response to the diesel fuel spill near Willard Bay State Park. The settlement will bring closure to the requirements outlined in the Notice of Violation and Compliance Order (NOV/CO) issued to Chevron on April 12, 2013. $4,450,000 to fund mitigation projects aimed at improvements in related waterways and facilities. These projects are above and beyond any clean-up actions by Chevron. $550,000 paid to the Department of Natural Resources Division of Utah State Parks and Recreation for lost use damages at the Willard Bay State Park following the spill. The public is invited to review and comment on the draft settlement agreement during the 30-day comment period running from Dec. 17, 2013, to Jan. 16, 2014. Written comments on the draft settlement document and related compliance order can be sent to Emily Bartusek at ebartusek@utah.gov, or P.O. Box 144870, Salt Lake City, Utah 84114-4870. DWQ must receive comments before 5 p.m. on Jan. 16, 2014. DEQ’s contractor was onsite from August 19-27, 2013 collecting sediment, soil, and water samples in accordance with Quality Assurance Project Plan (QAPP). Representatives from Chevron and Chevron’s contractor were also present during sampling. As specified by the QAPP, approximately 50 locations were selected at random for sampling. The media sampled included sediment samples from inside the impacted ponds. Upland soil samples were collected outside the perimeter of the ponds to confirm the extent of the impacted soils and sediment. DEQ’s contractor collected additional samples of both water and sediment from Willard Creek and the pond receiving water from Willard Creek. These areas were not impacted by the diesel spill but were sampled to provide information on the background concentrations of hydrocarbons in the area since the impacted area may contain hydrocarbons from sources unrelated to the spill, such as paving or runoff from I-15.Chevron is only responsible for contamination related to their spill. On August 22, 2013, a petroleum odor and staining was observed in sediment samples. A photo ionization detector (PID) used in the field confirmed that these odors were from hydrocarbons. Additional locations in this area were sampled and three samples were sent to the laboratory for rush analyses. The laboratory results (for VOCs and DROs) confirmed residual diesel contamination. The laboratory analyses measured elevated concentrations of TPH-DRO, trimethyl benzenes, isopropyl toluene, octadecane, and other diesel fuel components. The contractor used the PID in the field to delineate an area of higher hydrocarbon concentrations measuring approximately 15 feet by 40 feet. This area appears to be a subsurface depression lined by clay soils and filled with sand. Water levels were higher immediately after the spill and when the water level dropped, the diesel was trapped in this area. Inspection of the rest of the site found no locations with similar conditions, suggesting that this area is an isolated phenomenon. Chevron plans to voluntarily remove the contamination within the next two weeks with DEQ oversight. DEQ’s contractor will collect and analyze confirmation samples to ensure that the additional remediation is complete. The remaining samples were sent to the laboratory to be analyzed for total hydrocarbons-diesel range organics (TPH-DRO), semi-volatile organic compounds (SVOCs), and volatile organic compounds (VOCs). Evaluation of the results in the human health and ecological risk assessments will determine if the remediation efforts are complete and the park can reopen without restrictions. Results reported in a technical memorandum (54 KB) indicate that with access controls, such as a fence to keep the public out of the contaminated area, Willard Bay Park is safe to open to the public. In late June 2013, DEQ’s contractor collected water and sediment samples from the area impacted by the spill. This area is currently fenced to prevent public access. Areas outside of the fence have not been impacted by the diesel spill. The laboratory analyzed these samples for the presence and concentration of diesel-related compounds, including Volatile Organic Compounds (VOCs), Semi-Volatile Organic Compounds (SVOCs), and Total Petroleum Hydrocarbons (TPH), and diesel range organics. In addition to these target compounds, the lab reported results for other compounds that are unrelated to diesel. As expected, most of these other compounds were below laboratory detection levels. The highest concentration measured of each compound of concern was compared to risk-based screening levels. These levels are based on the assumption that a park visitor might accidentally or intentionally enter the fenced area and engage in activities that would result in potential exposures to water and sediment. Screening levels are intentionally highly protective. For instance, the screening levels assume the same person enters the fenced area 26 times, or once per week during the warmer months. the area inside the fence is safe for the public. Remediation and environmental sampling is wrapping up at the Chevron Pipeline Diesel spill site. TechLaw, the environmental contractor responsible for field oversight, has been supervising remediation efforts at the site and collecting soil and water samples from the affected areas. During May 2013, Chevron flushed water through Channels 1, 2, and 3 into Pond 1, North Pond 2, South Pond 2, and Pond 3. Refilling the ponds released some of the remaining contaminants from the soil into the water, where they could then be captured with absorbent materials. Petroleum sheen began to come off the soils as the water rose and Chevron placed pom poms in the water to absorb these diesel contaminants. Chevron took precautions to ensure water wasn’t released into the reservoir. TechLaw collected water samples for volatile organic compounds (VOCs), semi-volatile organic compounds (SVOCs), and diesel-related organics (DROs). Surface soils samples were analyzed for VOCs, SVOCs, poly-aromatic hydrocarbons (PAHs), and DROs. Odor and sheen were evident in some of the soils samples. All samples went to American West Analytical Laboratories (AWAL) for analysis. Some areas of soil with obvious contamination were removed. The water samples were nondetect for diesel contaminants. Chevron was given permission to release this water to the reservoir after DWQ reviewed the analytical results. Chevron has installed fencing around the channel/wetland complex to prevent inadvertent public exposure. TechLaw is currently evaluating a trespasser exposure scenario through a site specific Quality Assurance Project Plan (QAPP). The QAPP supports DWQ’s continued field investigation of the spill site through soil, surface water, and groundwater sampling to aid in the development of a risk assessment for human health and screening level ecological values from contaminants of concern (COCs) released during the spill. The North Marina remains closed. DWQ will evaluate and finalize the analytical results from sampling soon. Utah State Parks and State Risk Management will evaluate the findings from the risk assessment as well. State Parks and Risk Management have final authority for any decision to reopen the area to the public. Future efforts include the completion of larger scale human health and ecological risk assessments to determine that the cleanup efforts are complete and no long term threats to public health or the environment remain in the areas of contamination. Analytical results from fish samples taken in Willard Bay show no diesel contamination to fish from the March 19th spill. Since Willard Bay is a popular destination for sport fishing, there were concerns about possible impacts to fish and health risks to people consuming fish from the Bay. The Division of Water Quality (DWQ) and Utah Department of Health did a preliminary evaluation soon after the spill and found no identifiable health risks, since diesel-related contaminants were measured in only trace concentrations in Willard Bay and those trace amounts were expected to break down quickly in the water following the spill. To confirm this, scientists from the Division of Wildlife Resources and DWQ netted wipers, catfish, and gizzard shad from the reservoir on May 9, 2013. Scientists took tissue samples from fifteen fish; five samples from three species. Sampling the edible (muscle) portion of the fish ensured that the lab analysis included any contaminants that might have accumulated in the muscles or organs where they could potentially pose a health risk. DWQ sent seventeen samples, including two quality control samples, to an accredited laboratory for analysis for diesel-related contaminants. The lab analysis detected no diesel contamination in the fish sampled. This indhttps://deq.utah.gov/legacy/destinations/w/willard-bay/icates that fish from the reservoir are safe to eat. The North Marina at Willard Bay remains closed, with buoys prohibiting access to the contaminated beach area. The South Marina, including boat launch ramps, camping, and day use areas, is open. Chevron Pipe Line Company (CPL) has successfully completed hydrostatic testing of the Northwest Products System No.1 Oil Line near Willard Bay State Park, according to a prepared statement issued today. As a result, CPL has now received permission from the U.S. Department of Transportation Pipeline and Hazardous Materials Safety Administration (PHMSA) to place the line back in service under terms of the Corrective Action Order issued to CPL by PHMSA. The pipeline is being prepared to resume operations at a reduced capacity and is targeted to commence operating on Saturday, May 4, 2013. Trace concentrations of diesel-related contaminants (DROs) continue to be detected in water in the treatment area. Water is no longer flowing into the reservoir from the treatment area. Chevron is routing the clean water around the contaminated treatment area, which will make it easier to determine the extent of the remaining contamination in the soil and sediment. Removing the water from the treatment area has also dried up the beaver ponds. DWQ and Chevron are currently working on the sampling plan. Sampling will begin when the plan is completed. As of April 19, 453 barrels of diesel have been removed with an estimated 24 barrels remaining to emoved from the impacted soil. Cleanup and remediation activities are removing impacted soil and implementing erosion control measures. The goal is to restore the impacted area by early June. The South Marina and its park area have been and remain open to the public. Sampling data continues to indicate there is no long-term or short-term threat to human health, or the environment in Willard Bay. Sampling data results are posted as they become available.Chevron Pipe Line Company (CPL) also notified the other Unified Command members today that it has received permission from the US Department of Transportation Pipeline and Hazardous Materials Safety Administration (PHMSA) to conduct a pressurized water (hydrostatic) test of its pipeline. The hydro test is scheduled to begin before the end of April. 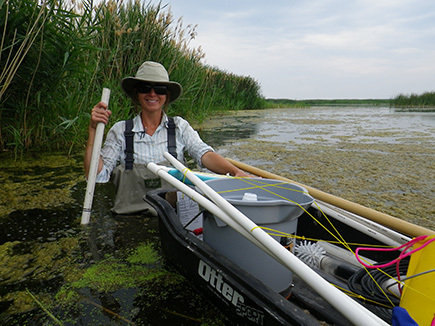 DWQ has received the volatile organic compound (VOC) analyses for April 11, the first day of sampling at the newly established site between the reservoir and the discharge from the beaver pond area. At that location, DWQ had one hit of trimethylbenzene at 2.6 mcg/L, which is above the detection limit of 2 mcg/L. No other VOCs were detected at this location or at any of the other surface sample sites. DWQ continues to detect hydrocarbons at the French drain sites (Xylene and Trimethylbenzene) in decreasing concentrations. The Division of Water Quality has issued a Notice of Violation and Compliance Order to Chevron. The Notice of Violation and press release announcing the issuance are below. Trace levels of diesel-related hydrocarbons measured in surface water samples collected near the Willard Bay Reservoir shoreline last week suggested to DWQ scientists that shallow groundwater flowing into the Bay may have been contaminated by the spill and the contaminated groundwater was bypassing the absorbent booms and draining into the Bay. Chevron constructed a French drain to intercept groundwater flowing westward into the reservoir. The first sample results on April 2, 2013 from this drain indicated that diesel contaminants had indeed reached the groundwater and were present in concentrations above human health and ecological screening levels. Chevron is treating the contaminated groundwater collected in the French drain and concentrations in the Bay have decreased over the past week, with samples registering as nondetect since April 8, 2013. As an example, DWQ graphs show the concentrations of diesel range organics (DROs) measured in water samples collected between March 30, 2013 and April 8, 2013 at three locations: in the Bay inside the booms (East of Boom), in the French drain (French Drain), and at the beaver ponds (Between Weirs). Other hydrocarbons present in these areas exhibited a similar pattern. Test pits have been excavated upgradient of the French drains to create a fingerprint map of the area to determine the extent of the groundwater contamination. Chevron has also installed monitoring wells to track contamination in the groundwater. Additional monitoring wells will be constructed throughout the spill area to evaluate the extent of the hydrocarbon contamination and effectiveness of the cleanup efforts over the long term. Groundwater contamination from the pipeline leak will not jeopardize the Park’s drinking water, which is supplied by Willard City. Preliminary assessments by DWQ and the Department of Health (DOH) suggest that fish from Willard Bay will likely be safe to eat. DWQ and DOH plan to sample fish for diesel-related contamination. Soils in the immediate area of the spill were removed and confirmation samples collected. The results for these samples indicate that the removal was successful. Similar determinations have not been made for sediments or soils in other impacted areas and DWQ will continue to work with the Bureau of Reclamation and Chevron to ensure adequate remediation of the impacted wetlands. Most recent data shows no contamination outside containment booms. monitor for any contamination. The sampling map (164 KB)shows the monitoring locations as of April 2, 2013. The sampling results show the final data reports available, along with the most current preliminary data. measured soon after the spill. Trimethylbenzenes (536 KB) and xylenes (538 KB)result maps show diminishing concentrations from monitoring locations (164 KB)as of March 29, 2013. Only actual detections are shown on the maps from sampling events. Outside of the containment booms, 49 out of 69, samples were nondetect, indicating that no hydrocarbons were detected for the majority of the sampling events. The Division of Water Quality has been actively collecting environmental samples associated with the Chevron pipeline spill near Willard Bay. The available analyses demonstrate that the response actions have been mostly successful in preventing the spilled diesel from contaminating Willard Bay. Sampling has occurred at least once per day since March 19, 2013, and the results will continue to be posted as they become available. The sample location map (694 KB) shows where samples were taken. The preliminary analytical results are available by date in the sampling results. These results are considered preliminary, pending completion of the quality control checks. Based on the known hydrocarbon constituents of diesel fuel and measurements in the area known to be impacted, the following hydrocarbons are suspected to be attributable to the spilled diesel: trimethylbenzenes (1,2,3-trimethylbenzene, 1,2,4-trimethylbenzene, 1,3,5- trimethyl benzene), benzene, toluene, ethylbenzene, naphthalene, 1-methylnaphthalene, 2-methylnaphthalene, octadecane, xylenes (ortho, meta, and para), n-propylbenzene, isopropylbenzene, 4-isopropyltoluene, total petroleum hydrocarbons diesel range organics (TPH-DRO). Other detected hydrocarbons are likely from other sources such as motorized watercraft and urban runoff. The results maps show a summary of selected preliminary analytical results for the sampling as of March 25, 2013. The concentrations of three volatile organic “marker” compounds (total trimethylbenzenes (727 KB), toluene, and total xylenes (728 KB)) were selected from the thirteen compounds listed above and then plotted on the maps. These results are compared to concentrations measured at multiple locations in Willard Bay outside of the containment booms. Only actual detections are shown on the maps from the 27 sampling events (multiple days and multiple locations) outside of the containment booms, indicating that no hydrocarbons were detected for the majority of the sampling events. The detections were at trace concentration (parts per billion) and were only detected immediately outside of the containment booms. Sample locations farther out did not detect the presence of hydrocarbons. Detected hydrocarbon concentrations were compared to screening values (37 KB). Screening values are intended to be protective of human health and aquatic life and act as benchmarks for chemical concentrations in a given media. Concentrations of trimethylbenzenes exceeded the tap water screening level for human health. The concentrations of toluene and xylenes were well below the human health screening levels, but did slightly exceed the aquatic life screening levels. Screening values are intended to protect for long-term exposures and overestimate the potential threat for short term exposures. These hydrocarbon concentrations are anticipated to decrease rapidly because of dilution and breakdown processes in the environment. Based on the currently available data, these concentrations are determined to not be a long-term or short-term threat to human health or the environment in Willard Bay. Future sampling will confirm these conclusions. 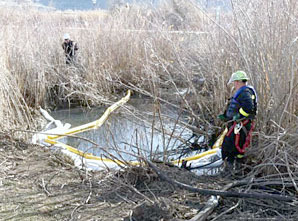 Preliminary reports underestimated the amount of diesel fuel leaking from a Chevron pipeline adjacent to Willard Bay. In a March 21, 2013 Corrective Action Order issued to Chevron Pipeline Company, officials with the Department of Transportation Pipeline and Hazardous Materials Safety Administration (PHMSA) pushed previous spill figures upward, estimating a release of approximately 600 barrels (about 25,000 gallons). Chevron had recovered approximately 21,000 gallons as of Friday, March 22nd. With an estimated 6,500 gallons remaining, the spill totals could go as high as 27,500 gallons. Accurate information on the amount of the spill will help officials track the progress of the clean-up. Booms and vacuum trucks were deployed to the spill site Tuesday, March 19th to contain and mitigate impacts to the water. Crews continued their clean-up efforts over the weekend. Preliminary investigation into the fuel leak indicates a failure along the pipeline’s longitudinal seam, but the exact cause is still unknown. The pipeline was constructed between 1949 and 1952 and contains both seamless and seamed pipes. The PHSMA inspected this line multiple times between April 2011 and September 2012 and issued a letter of concern to Chevron on February 14, 2013, citing potential safety concerns related to releases along other segments of the pipeline. In its Order, the PHSMA ordered Chevron to take immediate corrective action. Chevron cannot operate the affected pipeline segment until authorized to do so and must develop and submit a restart plan before it can resume pipeline operations. The Division of Water Quality (DWQ) has been conducting daily water sampling since Tuesday morning to measure the levels of any petrochemical contamination. On Friday, John Whitehead, Assistant Director at DWQ, reported that initial sampling analysis showed “trace elements of related compounds” at very low concentrations. Sampling results to date are preliminary. Detailed Quality Assurance of the laboratory analyses of water samples are in progress. Additional data will be available soon and will provide a better picture of any spill impacts to the waters in and around Willard Bay. A diesel fuel leak from a petroleum pipeline near Willard Bay State Park has raised concerns about the possible contamination of bay wetlands critical for migratory birds. The fuel spill occurred Monday afternoon and released an estimated 4,200 to 6,300 gallons of diesel fuel into a drainage ditch and retention pond less than a quarter mile away from the park. The pipeline release was first detected around 2:30 p.m. when a sensor indicated a drop in pipeline pressure. Chevron shut down the system immediately and dispatched responders to the site. Workers pinpointed the location of the leak about four hours later. Clean-up crews placed absorbent booms at the site to contain the diesel and began pumping the contaminated water into tanker trucks. Workers are removing pipe and dirt around the leak site. According to the U.S. Bureau of Reclamation, the diesel fuel spilled into adjacent Willard Creek, where a beaver dam stopped its flow into the reservoir. While it appears that the fuel did not enter the bay or reservoir, it is still unclear what impacts the spill will have on the immediate environment and the wildlife it supports. Environmental scientists from the Division of Water Quality (DWQ) responded to the spill and were on the scene Tuesday morning to collect water samples to assess the extent of the contamination. Analytical results from these samples will show whether spill-related petroleum compounds are present and in what concentration. DWQ will be working with the Environmental Protection Agency and Department of Transportation Pipeline and Hazardous Materials Safety Administration. DWQ will continue to sample and monitor the affected waters until the clean-up is completed.